If zombies are dead and feel no emotion, then why does this one look happy and eerily sinister? It only adds to the fear that this Transparent Female Zombie Mask creates with its frightening smile and it is bloody, injured appearance. This simple face mask is worn over your face via a thin strap that attaches to either side of the mask and wraps around the back of your head. The mask distorts your own appearance, making you all the more difficult to recognize. It adds a few frightening zombie details, including ripped flesh along the forehead and cheek, shallow and sunken eyes, and a sinister smile with bloody teeth. Two rivulets of blood drip from each side of the mouth. 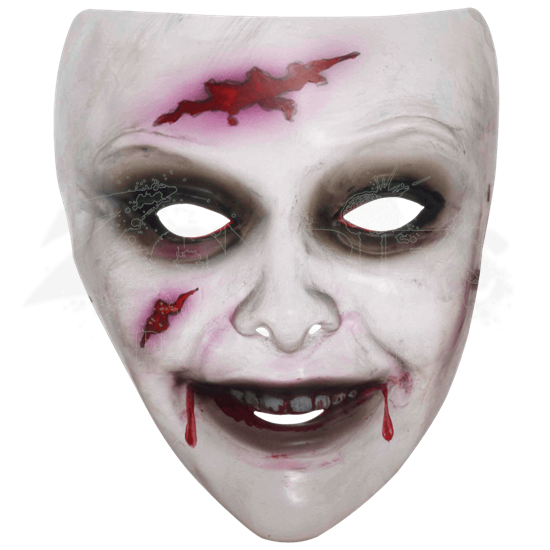 Wearing the Transparent Female Zombie Mask, it is not hard to put together a zombie look that is altogether eerie and frightening to behold.